UFC Welterweight Colby Covington isn't on the UFC 235 card, but that hasn't stopped in from causing a scene in Las Vegas ahead of Saturday's PPV event. Covington previously vowed to "make it a living hell for the UFC" if he wasn't given a title shot, and he seems intent on keeping his word. First, he crashed the open workouts with a megaphone earlier this week and trashed Kamaru Usman, who will be challenging Tyron Woodley for the Welterweight championship in the co-main event. He also hunted down UFC President Dana White at a blackjack table, demanding answers as to why he hasn't earned his title shot. 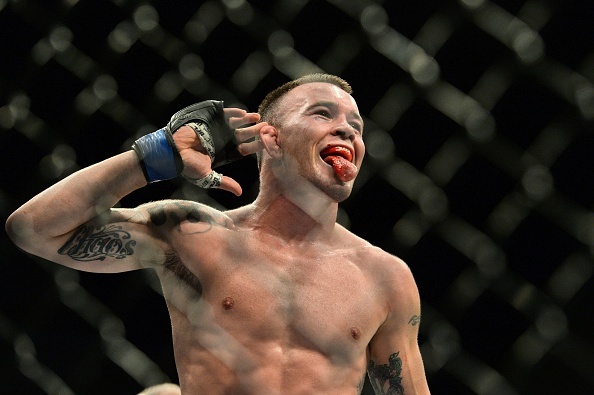 Covington, who is ranked ahead of Usman, has not fought in the UFC since defeating Rafael dos Anjos in June 2018 for the interim welterweight title. He was scheduled for a title fight against Woodley at UFC 228 in September, but was unable to fight on that date after having surgery to correct a nasal issue, according to sources. After he was skipped over for this Saturday's UFC 235 PPV, Covington threatened to file a lawsuit. “If the UFC wants to be a circus and be a corrupt business and go about their business, then that’s their problem,” he said (H/T MMA Junkie). “I’m standing up for what I believe in. I’m not backing down.